Prior to meeting Karl, our chocolate lab, Piper, would not leave our feet and would bark excessively during walks and also when she was in the field. By assessing her behavior, Karl was able to work with Piper in overcoming her fears and pack tendencies. She is now a confident, fun-loving dog. 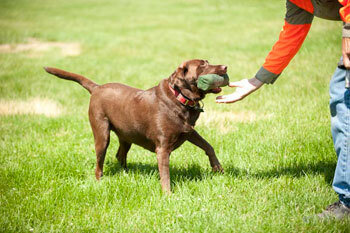 Piper also loves retrieving, whether in the yard, field or lake, and is no longer tied to our feet. In addition, she loves her trainer, Karl, so much that when he comes to visit she will not leave his side and cries when he leaves. I can't thank you enough for the training you gave Mocha. Taking a mixed breed and bringing out the best of both breeds is truly a talent that is rare. She has been doing great with pheasants, she has pointed over 10 roosters and 3 hens, all of them she locked up hard and stayed on point until the bird was shot (or missed). Her last 3 points had some 'style' to them too. Out of the roosters she had 3 that were perfect point-shoot-retreive to hand. 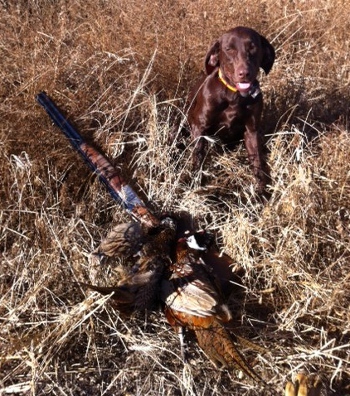 I lost track of how many retrieves she had total, she is a machine when it comes to retrieving. She also hunted with 4 different dogs over the 2 weeks of hunting and she did great with all of them. 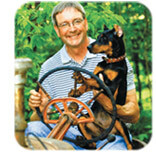 Thanks again and I will definitely be recommending your training to other dog owners I know. I would just like to let you know how nice it is for Mary and I to return home from a trip to find Rudy so content and happy. We can tell that he was in great hands over the past week. The luckiest thing that happened to us is when we bought the â€œDoggy Boot Campâ€ from the Dreams Auction at NDSCS 2 years ago. Since then, the several times we have brought Rudy to your facility has been nothing but positive for him. As discussed, Rudy will be making several visits this summer to Ivy League Dog Training to tweak his â€œsocial skillsâ€ and hunting enthusiasm. Take Care. Thanks for the excellent training session last week, Karl. Bentley is already showing signs of improvement!! Karl did a wonderful job of helping us finish out the obedience training or our 2 year old collie. He understands the specific nature of each breed...what makes them different and how they respond best. That was extremely helpful in developing Maddie into a terrific pet and genuine friend.